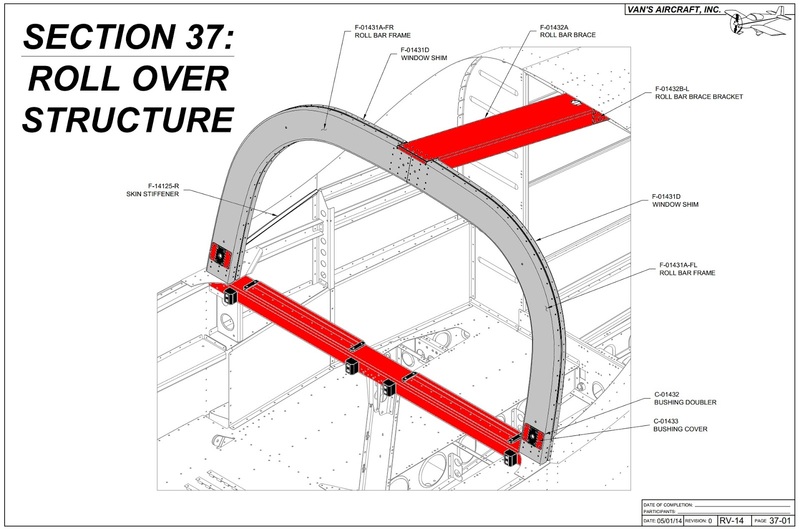 Fuselage: Roll over structure. Completed. The roll over structure construction is quite straight forward. A lot of cleco'ing and match drilling is required, along with copious care to ensure parts are mated aligned and remain so. The F-1231E Roll Bar Splice Plates are riveted on with the F-01431A-FL/FR Roll Bar Frames temporarily placed on the F-1231D Roll Bar Bases to lock the frames in place (below). I was able to get the forward frames to easily align together with the bases and splice plate. The aft frames, however, required significant prodding to achieve alignment. The frames are then fully cleco'd with all of their requisite parts, so that match drilling can commence. Here, every other cleco has been removed to support the match drilling process, later replaced with copper clecos (as an aside, I actually had to buy more copper clecos to complete this step). The F-01431D window shims need to be countersunk for CS4-4 rivets (remember to use your 120° countersink). Those shims aren't very thick, so without additional support, the holes would be hollowed out by the countersink pilot. Thus, I chose to countersink the shims when they were cleco'd on the roll over structure. Also, prideful rivets aren't desirable here, as the rear window rests on the shims. The parts are then uncleco'd, deburred and taken out to pasture, where they are cleaned, acid etched, scuffed, cleaned again, then primed (I opted to use Napa 7220 rather than mix up a batch of two part epoxy primer for such a small job, though a few parts were already primed previously and are thus white rather than gray). The parts are riveted together. Not yet knowing what my exterior paint scheme is going to be, and realizing that once the rear window goes on, painting the roll over structure becomes difficult (and impossible for the upper arc underneath the window), I decided to paint it the same color as my interior. I considered painting it black and even red, but decided that using the interior color would give me more options for the later, undefined, exterior paint scheme. Following final riveting, the final product is as below. Fuselage. Flap actuation system. Done. This was an interesting section for me. 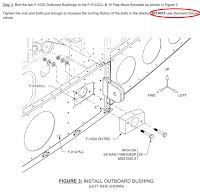 First, back in Section 32, when I placed the flap UHMW bushings, I foolishly fully torqued the bolts holding them in place, contrary to the explicit instructions in the plans. This caused the parts to distort, making it very hard for me to get the CS-00010 flap torque arms in place. In fact, I had to use a hobby knife and strategic manipulation of the torque arms to get them into the bushings, culminating in this fine sight. I eventually realized what I had done wrong and purchased new bushings, not looking forward to having to remove the originals since the baggage floors were already down. Plus, I originally used lithium grease rather than Aeroshell #5 wheel bearing grease called for in the plans. It turns out that it was relative easy to replace the bushings with some kinesthetic contortions and the help of a generous friend. Here the left torque arm sits, happily in its replacement bushing, properly greased (sorry, didn't take images prior to putting in the torque arms). I was also dreading having to cut the hole in the linear actuator shaft. I didn't want to screw it up and it seemed like a step easily done wrong. So I hemmed and hawed over it for a month then finally just sat down to do it. Following the approach given in the plans, I think it came out nice. I did break one drill bit, but in anticipation of that eventuality, I had purchased extra 1/16" bits. I also put the hole clocked 90° in the wrong direction. But it's a non-issue. The safety wire is placed to prevent rotation of the actuator shaft, should the jam nut get loose. That objective is still accomplished with my rotated hole. 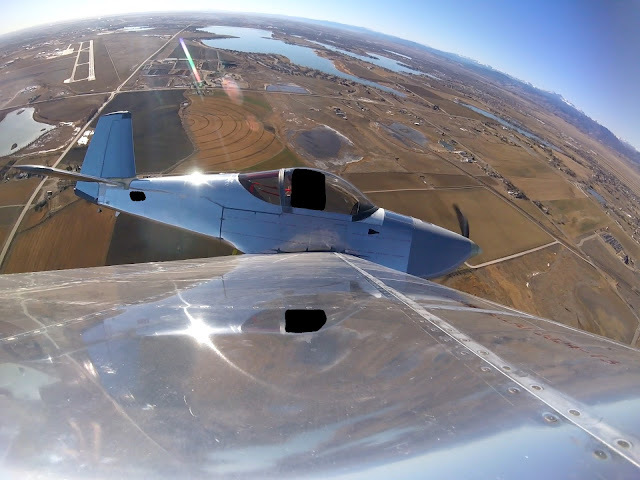 Fuselage: Aileron and Elevator Systems. Pushrods in. A relatively simple task to put the elevator pushrods in. I installed them in reverse order from the plans to facilitate access to my other workstreams. 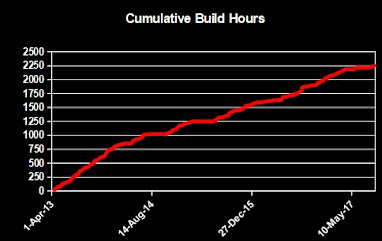 I actually built the pushrods back on 22-Jan-15. First I put the CS-00003 Aft Elevator Pushrod after placing the F-14139 Bellcrank Mount. The mount gives much needed rigidity to the F-1037B/C Battery Angles and F-01429-L/R Bellcrank Ribs (left). A strategically cut and placed piece of cardboard helps augment pushrod movement so it doesn't get caught on the bulkhead lightening hole (right). It took me a good hour to file down the F-01405E Idler Bracket so that the CS-000111 Idler Arms could freely travel. The clip on the right was easily bent back into place. 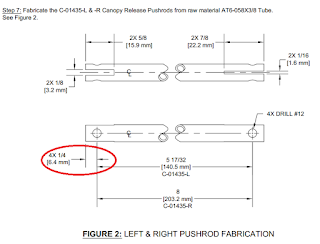 It's a bit of a challenge to reach the bolt that ties down the CS-00001 Forward Elevator Pushrod Assembly (left). But it can be done (right). I still have yet to set the stick base travel and other subsequent parts of Section 36. The upper forward fuselage assembly (primed last December, January and February and completed back in March) is cleco'd into place. It's easily riveted in solo. The F-141016 Wiring Channel is then riveted in. 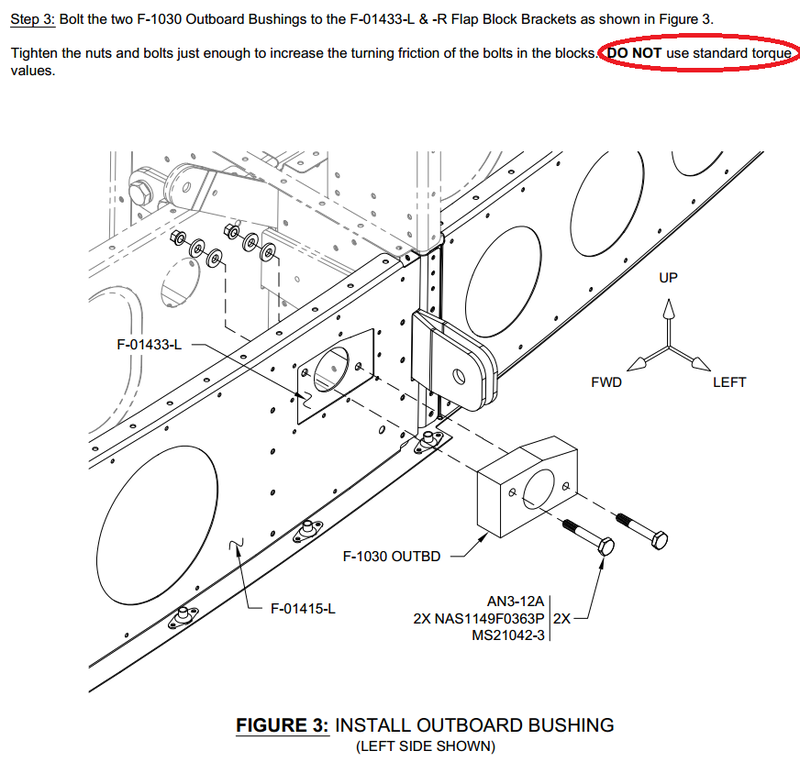 The plans call for LP4-3 rivets on the joining of the wiring channel to the F-01451-L/R Tunnel Sides. I was easily able to set AN470AD4-4 rivets with my longeron yoke. Then the F-01421A/B-L/R Canopy Decks are match drilled into the longerons. It's important to clamp everything down. Eventually, each hole becomes a #30. The Canopy Decks are removed, deburred and dimpled. You might consider using a 120° dimple die as you'll be putting CS4-4 rivets (I used 100° on accident though it turned out looking well enough). The longerons are then countersunk (a few holes are not, be careful). I supposed if you went with a 120° dimple die, you'd prefer the same angle on your countersinks. I suggest using a run of tape down the longeron to prevent countersink shavings from impinging into the space between side skin and longeron. I didn't take such a precaution on the right side and spent some quality time removing shavings out of that space. I opted to paint my canopy decks red, in keeping with my accenting many parts in red (rudder pedals, seat back guide, wiring channel, shoulder harness lugs and red harnesses). The decks are really only visible when the canopy is open. I suspect these parts will get scratched and the paint will eventually look ratty. I'll keep an extra can of spray paint around or I may have the decks painted with the exterior paint when that time comes. 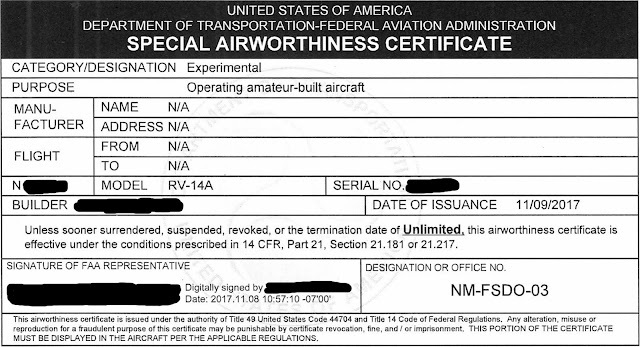 And yet again to prove that I still lack discipline in building my airplane...I had just returned from a 2 week business trip to Japan and was waking up at 3 A.M. What better thing to do than work on the build? So I went to town and put in the canopy decks only to later realize I forgot to lay down sealant along the longeron as called for on 35-11, Step 14. Ugh! I had to drill out all 65+ rivets. Turns out that went much quicker than putting them in. I then had to drill out and remove the rivets a second time as I realized I didn't use enough sealant. Never work on the plane when sleep deprived! Here's how it turned out. I like the contrast between the unpainted rivets and the painted decks. My guess is the paint won't hold up. Next the panel frame assembly (completed back on 31-Jan-15) is placed (left). After doing so, I realized I wanted the parts painted since much of this area will be visible when the canopy is opened. So after spending a good hour masking everything off, it got painted (right). In retrospect I wish I would have painted the frame and upper forward fuse assemblies prior to installation. Then it comes time for the canopy release mechanism. I used a Dremel with a cutting wheel to lop of the ends of the release pins. Then some excessively liberal use of the grinding wheel yielded this. Hopefully too much wasn't taken off. Luckily it's a marginally difficult to replace part if that was the case. 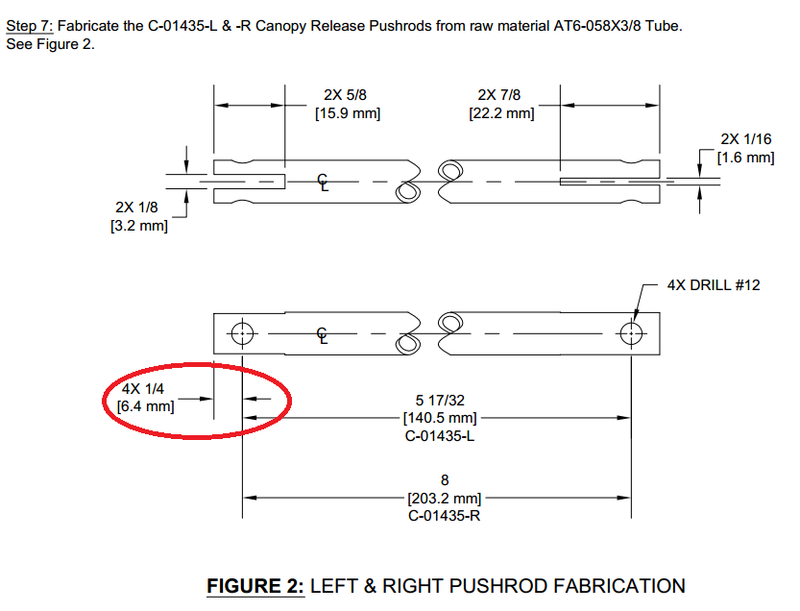 When cutting the C-01435-L/R Canopy Release Pushrods, be careful to include the 1/4" extra on both sides. I did on the longer one, but not the shorter, causing me to buy to a replacement AT6-058X3/8 tube. Update 23-Dec-16: I later dispensed with the hinges along the top in favor of quarter turn fasteners. That process is illustrated here. Then the F-01471 Forward Top Skin get cleco'd in place for match drilling the FF-00006A/C Cowl Attach Piano Hinges. As I learned from the FF-00006B-L/R hinges from Section 29, drilling the pilot hole can lead to a poorly aligned hinge. So I dispensed with that step in favor of clamping the part securely after lining it up properly, then drilling/cleco'ing. Eventually it all gets match drilled. Later the hinges need to be countersunk and the skin/shims/firewall dimpled. I have elected not to rivet in the forward top skin (a.k.a. 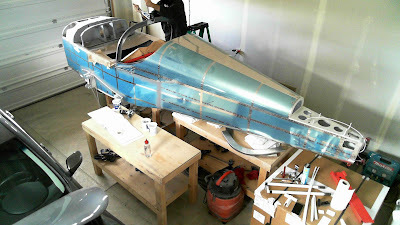 "boot cowl") until after wiring of the panel and engine are complete in an effort to support easier access to the firewall and instrument panel assembly. So work on this section terminates in anticipation of a future continuance.